Making soap is an in depth process. It takes precision, practice, and a desire to produce great soap products. It also takes great knowledge and wisdom to produce an organic, healthy soap for your body. Rosanne's soaps are amazing in both their scent and their moisturizing qualities. They are also long lasting, which is an important quality in a handmade soap. I was able to try out Rosanne's Pure Organic Shea Butter. I absolutely love the biodegradable jar!! How eco friendly is that! An absolute moisture experience for you skin! Use this shea butter after you use the beautifully scented soaps for a spa like experience! 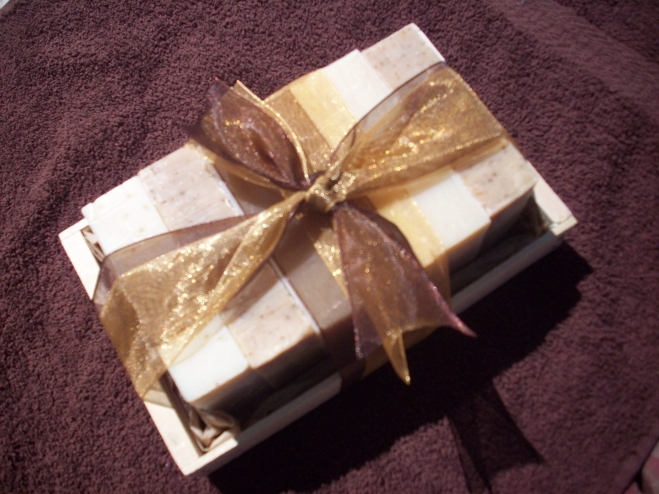 This Assorted Soap Gift Set would make a beautiful holiday gift! At only $35, it really is a great product! Be watching for an upcoming giveaway with Bare Body Soaps!! And while you are waiting be sure to get your order in to Rosanne for your Christmas Gift Giving! What product at Bare Body Soaps are you most excited about trying?? I'm most excited to try the Organic Shea Butter! The lavender and the patchouli scents in the soap! I'd like to try their cocoa mint soap. I would love to try their Organic Rose Geranium Soap! I would like to try their organic shea butter. I would love to try the green tea and lemongrass scent. I would like to try any of the organic bar soaps. I'd like to try the MAN soap and the ROSE GERANIUM. I would love to try the almond scented soap! I love that these are organic and made in the USA, I am most excited about trying the bar soaps.